A local group plans to power the entire county with 100 percent renewable energy — within 10 years. Northport Energy was founded a decade ago with a singular mission: to make the tip of Leelanau County completely green. The group hasn’t gotten there yet, but it’s had some significant achievements. Members have helped establish one of the first “net zero” golf courses in the country. 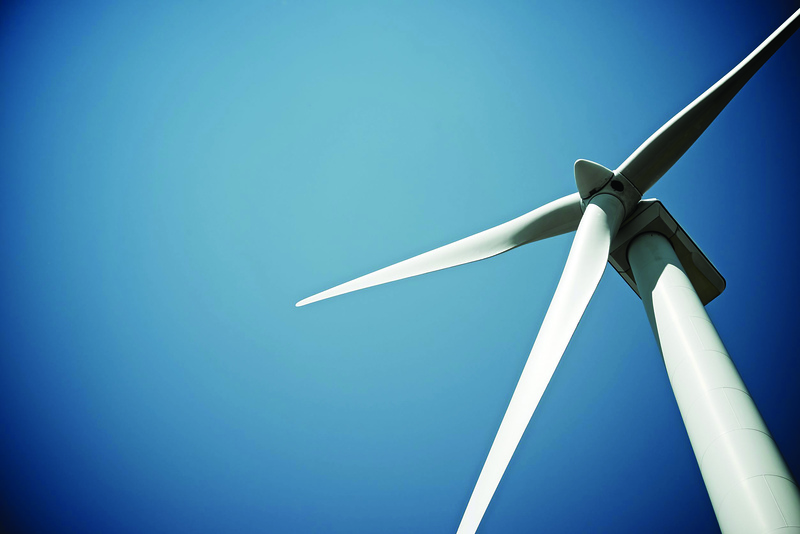 They’ve seen a wind turbine installed to help power the town’s wastewater treatment facility. And they’ve set up renewable projects across the Village of Northport and Leelanau Township. Upon their 10th anniversary, they embarked on an even more ambitious goal: They’re devising a plan to power all of Leelanau County with 100 percent renewable energy. And they’re determined to do it within a decade. It is an extraordinary project, said Brandon Smith, one of three graduate students at the University of Michigan’s School of Environment and Sustainability who have been recruited to map out a strategy to rid Leelanau County of coal-fired power. Northport Energy board member Peter Wolcott wrote the application for the grant that is funding the students’ work, and he’s optimistic about the project. He said the idea to go county-wide was bolstered when Northport Energy started to hear from people elsewhere in the county who were interested in what they were doing and wanted in. The project launched in November, and the students are expected to complete their study by April. Walcott said the project has the potential to be transformational. If the group succeeds, it could potentially domino across the nation, show people around the country how to power a rural, out-of-the-way place entirely with green energy. This is the third time Northport Energy has worked with U-M graduate students to further its green energy ambitions. Several years ago, a group of students studied how Leelanau Township could become 100 percent renewable. Two years after that, other students studied how to promote and assist the development of residential solar projects in the region. While Leelanau Township is still a long way away from its ultimate goal, and the expansion of residential solar projects have slowed amid shrinking incentives offered by utilities, Leelanau County is particularly well positioned to achieve the 100 percent goal, Smith said. In the first place, it’s home to the people who started Northport Energy — a clear indication there is the kind of homegrown interest in renewables that such an ambitious project requires. “This county has a lot of motivation, and I don’t say that lightly. The fact that Northport Energy actually exists as an entity within the county kind of gives credit to how much hutzpah this county has,” Smith said at a town meeting in November. Also helping matters: Leelanau isn’t too big, and it lacks the massive, industrial-scale energy users that would render the goal near impossible. Leelanau does have some disadvantages, however. Locations for sites that could host solar and wind turbine installations are severely limited. Parkland located in the Sleeping Bar Dunes National Lakeshore or township parks are out because regulations do not allow solar or wind installations in those places. And off-shore wind installations are also off the table. The group of graduate students said they removed that option at that outset, knowing that including it would generate strong opposition to their work. Another possible means to get Leelanau County to 100 percent renewable would be a large-scale wind farm. But that’s not under consideration either. About a decade ago, a vast wind farm was proposed for Centerville Township, in the southern center of the county, and the reaction was unequivocal. That proposal, however, included 60 to 80 wind turbines and was promoted by a company from outside the area. Northport Energy believes it can come up with something more palatable to Leelanau County residents, one that requires only a handful of turbines that could be located in carefully selected places where they would have minimal impact on neighbors. Smiley notes that today’s turbines generate much more electricity than those of a decade ago. He referenced a development by Traverse City-based Heritage Energy that’s located on the Upper Peninsula’s Garden Peninsula. That site features windmills so powerful that even one could generate 75 percent of Leelanau Townships energy needs. That Garden Peninsula development, however, prompted a lawsuit from neighbors and opposition to an effort to seek permission to expand the development this year. Renewable energy advocate Skip Pruss said he believes that opposition to wind turbine projects isn’t organic, but rather spurred on by oil and gas industry operatives who attempt to sew discord whenever a large project is proposed. In the Garden Peninsula case and elsewhere, opponents charge that the noise and light flicker from large wind turbines can cause health problems, though this has never been proven. Ultimately, almost all opposition is wrapped up in aesthetic concerns, and Pruss said it’s important to understand that and prepare for opposition before making proposals. Smiley and Smith said it is important to get township officials on board and craft a plan that can accommodate concerns from residents about aesthetics. To do that, they need to find the places in the county where solar farms or wind turbines could be located without raising the ire of neighbors. How do you transform the infrastructure of a pristine, rural paradise that’s home to many residents who don’t want to see things change? That’s what the U-M students set out to answer at that presentation in Northport to launch their study. Two of the three students, Smith and Abhijeet Walchale, made a presentation to a group of 30 or so residents. They explained that they will set out to study the potential for wind and solar at locations throughout the county to determine where in Leelanau wind or solar installations could be located. They also plan to measure energy use and projected energy use in the county, taking into account that energy consumption is bound to rise as more and more residents switch to electric vehicles and charge those at home. They also plan to study how energy storage will play a part in the achievement of the 100 percent goal. For one thing, they expect county residents will begin to drive electric vehicles at a higher-than-average rate, given Leelanau’s demographics. Smith said his team had already thought about that and concluded it could be an advantage, because those EV vehicle batteries could be a means to store electricity. When the wind blows at night and demand for energy is low, those vehicles can be charged. Moreover, they might represent a battery factory that could be used by the grid. The U-M team will also look at other energy storage options, though there aren’t a lot of options that are immediately apparent. Smith and Smiley said they are looking for suggestions. They don’t expect that anything large-scale, like Ludington’s pumped storage plant, would be suitable for Leelanau. That plant stores energy at night by using it to pump water into a reservoir, and then produces electricity during the day by releasing the water to turn hydro-turbines. Battery farms at brownfield sites around the county are a more likely solution for Leelanau County, Smith said. However, the whole plan hinges upon how receptive the county’s utilities will be to accommodate the radical changes Northport Energy plans to propose for the county’s electrical grid. “To be completely honest, I was expecting pushback from Consumers and Cherryland, because what we’re doing impacts them directly,” Smith said. Instead, Smith said, the people he met with at the utilities were encouraging and generous in sharing data the U-M team needs to complete its study.